The Brant Hotel in 1902. Located on the shore of Lake Ontario in Burlington, the hotel was erected on the former homestead of Joseph Brant, and was the largest resort in Canada. The hotel was expropriated and used as a military hospital in 1917, demolished and rebuilt in the 1930s, and then demolished in 1964. Before pioneer settlement in the 19th century, the area was covered by the primeval forest that stretched between the provincial capital of York and the town of Hamilton, and was home to various First Nations peoples. In 1792, John Graves Simcoe, the first lieutenant governor of Upper Canada, named the western end of Lake Ontario "Burlington Bay" after the town of Bridlington in the East Riding of Yorkshire, England. By the time land beside the bay was deeded to Captain Joseph Brant at the turn of the 19th century, the name "Burlington" was already in common use. With the completion of the local survey after the War of 1812, the land was opened for settlement. Early farmers prospered in the Burlington area because the area had fertile soil and moderate temperatures. Produce from the farms was shipped out via the bustling docks of the lakeside villages of Port Nelson and Wellington Square, as well as Brown's Wharf in the nearby village of Port Flamborough (which was to become Aldershot). Lumber taken from the surrounding forests also competed for space on the busy docks. However, in the latter half of the 19th century, increased wheat production from Western Canada convinced local farmers to switch to fruit and vegetable production. As more settlers arrived and cleared the land, cash crops replaced subsistence farming. Gradually, mixed farming and market gardens became the dominant form of agriculture, and in the early 20th century the area was declared the Garden of Canada. The first peaches grown in Canada were cultivated in the Grindstone Creek watershed in the city's south-west part. The farming tradition has passed down through the generations. Today over forty percent of the Grindstone Creek watershed is still devoted to farms, orchards and nurseries. Following the Second World War, cheap electricity from nearby Niagara Falls and better transportation access due to the new (1939) Queen Elizabeth Way encouraged both light industry and families to move to Burlington. The population skyrocketed as new homes were built, encouraging developers to build even more new homes. 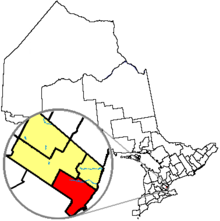 On 1 January 1958, Burlington officially annexed most of the Township of Nelson, as well as Aldershot, formerly a part of East Flamborough Township. By 1967, the last cash crop farm within the city had been replaced by the Burlington Centre. Burlington's climate is humid continental (Köppen climate classification Dfa) with warm, humid summers and cold, somewhat drier winters. The climate is moderated by its proximity to Lake Ontario. Monthly mean temperatures range from 22.5 °C (72.5 °F) in July to −4.4 °C (24.1 °F) in January. The average annual precipitation is 763 millimetres (30.0 in) of rain and 99 centimetres (39 in) of snow. Although it shares the temperate climate found in Southern Ontario, its proximity to Lake Ontario moderates winter temperatures and it also benefits from a sheltering effect of the Niagara Escarpment, allowing the most northerly tracts of Carolinian forest to thrive on the Escarpment that runs through western sections of city. Several species of flora and fauna usually found only in more southern climes have their only Canadian presence here including paw-paw, green dragon (Arisaema dracontium), tuckahoe (Peltandra virginica), American columbo (Frasera caroliniensis), wall-rue (Asplenium ruta-muraria), plus the Louisiana waterthrush, the hooded warbler, the southern flying squirrel and the rare eastern pipistrelle. Near the visible promontory of Mount Nemo that rises some 200 m (650 ft) above the lake level, a "vertical forest" of white cedar clinging to the Escarpment face includes many small trees that are more than a thousand years old. Hamilton Harbour, the western end of Lake Ontario, is bounded on its western shore by a large sandbar, now called the Beach strip, that was deposited during the last ice age. A canal bisecting the sandbar allows ships access to the harbour. The Burlington Bay James N. Allan Skyway (part of the Queen Elizabeth Way), and the Canal Lift Bridge allow access over the canal. The 2016 census records a visible minority of 16%. The top eight ethnic origins from the 2006 census are listed in the accompanying table. Percentages add up to more than 100% because respondents were able to choose more than one ethnicity. According to the 2011 Census, English is the mother tongue for 80.7% of the residents of Burlington, followed by French (1.8%), Polish (1.3%), Spanish (1.2%), German (1.1%) and Italian (1.1%). However, Statistics Canada warned that "data users are advised to exercise caution when evaluating trends related to mother tongue and home language that compare 2011 census data to those of previous censuses," due to the discontinuation of the mandatory long census form by the federal government. In the 2001 Canadian census, 78% of Burlington residents identified themselves as Christian. Of these, approximately 41% claimed adherence to one of the mainstream Protestant churches or were Anglican, 32% were Roman Catholic, and the remaining 27% belonged to other denominations such as the Church of Jesus Christ of Latter Day Saints (Mormons), the Ukrainian Catholic Church, and various Orthodox denominations. [not in citation given] Of the remaining 22% of the population that did not identify themselves as Christian, 16.6% identified themselves as following no religion, 1.0% were Muslim, 0.7% Sikh, 0.5% Hindu, 0.4% Jewish, 0.3% Buddhist, and 0.1% Pagan. Burlington's economic strength is the diversity of its economic base, mainly achieved because of its geography, proximity to large industries in southern Ontario (Canada's largest consumer market), its location within the Greater Toronto and Hamilton Area (GTHA) and proximity to Hamilton, and its transportation infrastructure. This diversity has allowed for sustained growth with regards to the economy. The city has a robust economy with potential for growth – it is at the hub of the Golden Horseshoe, is largely driven by both the automotive and manufacturing sectors. No single employer or job sector dominates Burlington's economy. The leading industrial sectors, in terms of employment, are food processing, packaging, electronics, motor vehicle/transportation, business services, chemical/pharmaceutical and environmental. The top five private sector employers in Burlington are Fearmans Pork Inc, Cogeco Cable, Evertz Microsystems, Boehringer Ingelheim and EMC2. Other notable business include The EBF Group, ARGO Land Development, and The Sunshine Doughnut Company. The largest public sector employers in the city are the City of Burlington, the Halton District School Board, the Halton Catholic District School Board and Joseph Brant Hospital. Burlington Centre and Mapleview Centre are popular malls within the city. The many summer festivals in the city, include Canada's Largest Ribfest, and the Burlington Sound of Music Festival which also attract many visitors. Burlington is primarily served by media based in Toronto (other than those noted below), as it is geographically in the Greater Toronto and Hamilton Area (GTHA). Yes TV is based in Burlington with studios on the North Service Road near the junction of the QEW, 403 and 407. There are seven public high schools and three Catholic high schools in Burlington. There are 13 private schools in Burlington. McMaster University DeGroote School of Business – Ron Joyce Centre opened in September 2010 and offers MBA and Executive Management programs. Burlington Transit, the public transport provider in the city, provides service on a transportation grid centred on three commuter GO Train stations: Appleby, Burlington and Aldershot. Major transportation corridors through the city include the Queen Elizabeth Way, Highway 403, Highway 407, and Dundas Street (former Highway 5). Commuter rail service is provided by GO Transit at the Burlington GO Station and the Aldershot GO station. Intercity rail service is provided by Via Rail at Aldershot, which also serves Hamilton. Rail cargo transportation is provided by both Canadian National Railway and Canadian Pacific. On 26 February 2012, a Via Rail train traveling from Niagara Falls to Toronto Union Station derailed in Burlington, with three fatalities. The federal and provincial riding of Burlington, which covers a large portion of the city of Burlington. (The riding of Halton covers the northeast parts of the city) Author: Elections Canada. The city is divided into six wards, each represented by a city councillor. The mayor, who chairs the city council, is Marianne Meed Ward. There are 115 parks and 580 ha of parkland in the city. On the shore of Lake Ontario, Spencer Smith Park features an expansive shoreline walking path. The park is newly renovated, with an observatory, outdoor pond, water jet play area and restaurant. Many annual free festivals take place in Spencer Smith Park, including Canada's Largest Ribfest and the Sound of Music Festival, Canada Day, Children's Festival and Lakeside Festival of Lights. There is also the semi-annual prix fixe Taste of Burlington dining event. The Brant Street Pier opened in Spencer Smith Park during the Sound of Music Festival on Father's Day weekend, 2013. Thousands of people from Burlington and beyond flocked to the pier to enjoy sunshine and scenic views. The pier extends 137 metres over Lake Ontario and provides views of the lake and Burlington's shoreline. The Art Gallery of Burlington is adjacent to Spencer Smith Park, and contains diverse permanent and changing exhibits. The Gallery houses a prominent collection of Canadian ceramics. The Gallery's exhibition spaces, which feature new exhibitions every eight to ten weeks, are fully accessible and are free to visitors. "Royal Canadian Naval Association Naval Memorial (1995)" by André Gauthier is a 6'4" high cast bronze statue of a WWII Canadian sailor in the position of attention saluting his lost shipmates, which was erected in Spencer Smith Park. The model for the statue was a local Sea Cadet wearing Mike Vencel's naval service uniform. On the black granite base, the names of Royal Canadian Navy and Canadian Merchant Marine ships sunk during WWII are engraved. On the granite wall, the names of all Royal Canadian Navy ships and Canadian Merchant Marine vessels which saw service in WWII are engraved. A monument commemorating the Korean War was erected in the summer of 2014 to mark the 61st anniversary of the armistice to end the war. Burlington is home to the Royal Botanical Gardens, which has the world's largest lilac collection. Ontario's botanical garden and National Historic Site of Canada features over 2,700 acres (11 km2) of gardens and nature sanctuaries, including four outdoor display gardens, the Mediterranean Garden under glass, three on-site restaurants, the Gardens' Gift Shop, and festivals. Lasalle Park, in the Burlington neighbourhood of Aldershot, is owned by the city of Hamilton but is leased by Burlington, which also assumes responsibility for maintenance. Several conservation areas are minutes away and feature year round activities. Mount Nemo Conservation Area is the only area in Burlington that is operated by Conservation Halton. Bronte Creek Provincial Park, along the city's eastern boundary, features a campground and recreational activities and events year-round. The local sections of the Bruce Trail and the Niagara Escarpment, which is a UNESCO designated World Biosphere Reserve, provide excellent hiking opportunities. Kerncliff Park, in an abandoned quarry on the boundary with Waterdown, is a naturalized area on the lip of the Niagara Escarpment. The Bruce Trail runs through the park, at many points running along the edge of the cliffs, providing a clear overlook of Burlington, the Burlington Skyway Bridge, Hamilton, and Oakville. On a clear day, one can see the CN Tower in Toronto, approximately 50 kilometres (31 mi) from the park. Burlington offers four indoor and two outdoor pools, four splash pads, nine ice pads, four community centres and nine golf courses. The Appleby Ice Centre is a 4-pad arena, used year-round for skating and ice hockey. The Burlington Performing Arts Centre opened in 2011. This 940-seat facility is on Locust Street in the downtown core. It contains two theatres for theatrical and musical performances. Burlington Centre - a one-storey mall at Guelph Line and Fairview Street, opened in 1968, with several renovations completed at various intervals over the years. Mapleview Centre – a two-storey mall, opened in 1990, located at the intersection of Fairview Street and Maple Avenue. Leases retail space to many upscale and destination stores including Banana Republic, Guess?, XXI Forever, H&M, Bath & Body Works and Pink by Victoria's Secret). Expanded in 2009 with the opening of additional stores including GUESS by Marciano, Zara, Coach, Aritzia, Apple Store and Sephora. The Burlington Teen Tour Band has operated in the city since 1947, including members between the ages of 13 and 21. The marching band, nicknamed The Redcoats due to the colour of its uniforms, are regular participants in major international parades. They are also referred to as "Canada's Musical Ambassadors" and have represented Canada all over the world. One such occasion was during the 2008 Tournament of Roses Parade, where the band represented Canada for the fourth time in the band's history. The band is led by Rob Bennett, managing director, along with Sir William Hughes, musical director. The Junior Redcoats are the younger version of the Teen Tour Band. The band includes children between the ages of 9 to 12. The Junior Redcoats' major performances are most commonly at the Burlington Santa Claus Parade, the Waterdown Santa Claus Parade, Hamilton Place (along with the Teen Tour Band) and the Sound of Music Parade. Bill Rolfe directs the Junior Redcoats. The Burlington Concert Band has been in operation since 1908. The band, composed of local volunteer musicians, plays a wide variety of musical styles and repertoire. It primarily performs to raise money for charitable causes. The Burlington Concert Band is a participating member of Performing Arts Burlington as well as the Canadian Band Association. The band maintains an open membership policy, allowing anyone who feels they can handle the music competently to join without an audition. Its primary venue has been the Burlington Performing Arts Center since it opened in 2011. Zoltan Kalman directs the Burlington Concert Band that is led by an elected board headed by Steven Hewis. Since 1961, 715 "Mohawk" Squadron of the Royal Canadian Air Cadets has been a fixture in the city. The Royal Canadian Air Cadets is only one of the three branches of the Canadian Cadet Movement. The CCM is a partnership between the Department of National Defence, and each of the three cadet leagues: The Air Cadet League of Canada, The Army Cadet League of Canada, and the Navy League. The CCM is the largest federally funded youth program in Canada, and is open to youth ages 12–18 who are interested in leadership, citizenship, physical fitness, the Canadian Forces, and personal discipline. The Army Cadet Corps is 2379 Royal Hamilton Light Infantry Army Cadet Corps. Burlington Area Scout traces its organization back to 1910 when the town's population was about 1,000. The first local Scoutmaster was Archie McGibbon, who remained in his position for more than a year, after which there was a succession of leaders including Hughes Cleaver and William Gilbert. The original enrolment of 25 boys was considered excellent for the small population of Burlington. In approximately 1918, Rev. George W. Tebbs took over the troop. It was in the 1920s when Scoutmaster Tebbs and the local troop met Robert Baden-Powell in Burlington. The founder was motoring to Toronto and broke his trip for a short while when he saw the Scouts lined up at Gore Park on the waterfront. For many years, Rev. Tebbs led the boys as they marched out of town, hauling the trek cart to a distant camping location. It wasn't until 1958 that the Scouts' combined group committees were able to buy the 90-acre (360,000 m2) camping grounds in North Burlington at Camp Manitou. The current Burlington Area Scouts came into existence in 1958 as "Burlington District" with amalgamation of several groups from Burlington and surrounding area. There are 17 active groups within the Area, providing Scouting to over 700 members. The Area stretches outside the city limits of Burlington and encompasses the additional communities of Waterdown, Kilbride, and Carlisle. Also, Burlington, Ontario founded the Burlington International Games (B.I.G.). The games were first held in 1969 " to offer an athletic and cultural exchange experience for the youth of Burlington." Until recently, the games took place between Burlington, Ontario and Burlington, Vermont, United States. But, other cities from places such as Quebec, Japan, the Netherlands, and the U.S. have all had athletes compete since 1998. The games celebrated their 40th anniversary in 2009 and this competition ceased in 2010 due to limited participation in recent years. Robert Bateman, (1930– ), painter. Margaret Lindsay Holton, (1955– ), artist, author, and designer. Kelly Richardson, (1972– ), artist, born in Burlington. James Sidney, author and environmentalist. James Anthony – (1955– ), USA Hall of Fame Blues Guitarist. Boys Night Out – rock band. Jeff Danna – (1964–), film music composer. Melissa McClelland – (1979–), singer and songwriter. Steve Bauer, (born 1959), road bicycle racer; Olympic Silver Medalist (1984 Los Angeles Games); competed in 11 Tours de France, one of only two Canadians to wear the Yellow jersey; born in St. Catharines but resides in Burlington. Ryan Bomben (born 1987), current offensive guard for the Hamilton Tiger Cats of the Canadian Football League. Cory Conacher (born 1989), NHL player, Buffalo Sabres, New York Islanders, Syracuse Crunch. Angela Coughlan (1953–2009), swimmer, winner of a bronze medal at the 1968 Olympic Games; a gold, two silvers and a bronze at the 1970 British Commonwealth Games; a gold and three silvers at the 1971 Pan American Games. Adam Creighton (born 1965), retired professional hockey player who played 708 NHL games. Tony Gabriel (born 1948), retired CFL tight end with the Ottawa Rough Riders and Hamilton Tiger-Cats. 8-time CFL all-star, league MVP 1978, twice winner of the Grey Cup. Graham Hood (born 1972), competitive middle distance runner, Olympian, Pan Am Games champion; Born in Winnipeg but raised in Burlington. Competed at 1992 Olympics (Barcelona) and 1996 Olympics (Atlanta). Gold medallist, 1500 m, at 1999 Pan Am Games (Winnipeg). Russ Jackson, retired CFL quarterback, has lived in Burlington since his retirement from teaching. Jesse Lumsden (born 1982), running back with the Edmonton Eskimos and the Hamilton Tiger Cats of the Canadian Football League and Canadian Olympian in the Men's Two and Four-Man Bobsleigh at the Vancouver 2010 Olympics; attended Nelson High School. Trevor Meier (born 1973), former Swiss Nationalliga 'A' Hockey Player, various clubs 1993–2012; born in Oakville, raised in Burlington, and resides in Switzerland. Andy O'Brien (born 1979), Irish soccer player, Star Striker of the 2004–2005 UCD Super League Champions, Surprise X Saint Germain. Dave Ridgway (born 1959), placekicker, Saskatchewan Roughriders CFL 1982–1996. Attended M.M. Robinson High School. Inducted into Canadian Football Hall of Fame in 2003. Played NCAA football for the University of Toledo Rockets 1977–1980. Melville Marks Robinson (1888–1974), founder of the Commonwealth Games. Jordan Szwarz (born 1991), Ice Hockey player for the Providence Bruins of the AHL. Renata Fast (Born 1994), hockey player. Jillian Barberie, (1966– ), actress and television hostess, attended Assumption Secondary School. Carlos Bustamente – YTV The Zone host, attended Notre Dame Catholic Secondary School. Jim Carrey, (1962– ), comedian and actor, attended St. Francis Xavier School for grades, 6, 7 and 8; and Aldershot High School for grade 9. Ryan Gosling, (1980– ), actor, attended Lester B. Pearson High School. Torri Higginson, (1969– ), actress. Ellora Patnaik, (1968– ), actor and odissi dancer. Leslie Mahaffy (July 5, 1976 – June 16, 1991) was a resident of Burlington and a murder victim of serial killers and rapists Paul Bernardo and Karla Homolka. ^ a b "Burlington, City Ontario (Census Subdivision)". Census profile, Canada 2011 Census. Statistics Canada. 8 February 2012. Retrieved 24 February 2012. ^ "Arts & Entertainment" (PDF). Building Stories. Retrieved 18 February 2015. ^ Rayburn, Alan (1997). Place Names of Ontario. Toronto-Buffalo-London: University of Toronto Press. p. 48. ISBN 0-8020-7207-0. ^ Halton: Rising, Wild and Beckoning. Conservation Halton. 1998. ^ Reynolds, John Lawrence (June 1993). "Sounds by the Shore: A History of Burlington, Ontario, Canada". City of Burlington. Archived from the original on 4 March 2016. Retrieved 7 December 2008. ^ "Niagara Escarpment Commission: Flora & Fauna". Niagara Escarpment Commission. Archived from the original on 30 July 2012. Retrieved 21 March 2009. ^ "Burlington TS". Canadian Climate Normals 1981–2010. Environment Canada. Retrieved 9 April 2014. ^ "Community Profiles from the 2006 Census, Statistics Canada – Census Subdivision". 2.statcan.ca. 6 December 2010. Retrieved 10 March 2011. ^ "Ethnocultural Portrait of Canada – Data table". 2.statcan.ca. 6 October 2010. Retrieved 10 March 2011. ^ "Census Profile, 2016 Census: Burlington, City". Statistics Canada. ^ Canada, Government of Canada, Statistics. "Statistics Canada: 2011 Census Profile". www12.statcan.gc.ca. Retrieved 27 March 2018. ^ Canadian Press (28 October 2012). "Long-form census cancellation taking toll on StatsCan data: Questions raised over how data can be used reliably". CBC News. Toronto: cbc.ca. Retrieved 28 October 2012. ^ a b Maxwell, Glynis (2005). "Burlington: Voices, Perspectives and Priorities" (PDF). Burlington ON Canada: Community Development Halton: 14. Archived from the original (PDF) on 22 May 2006. ^ "Reasons Why People Should Move to Burlington". Bronte Movers. Archived from the original on 19 March 2014. ^ "BRONTE GREEN - ARGO". 8 January 2016. Retrieved 9 August 2016. ^ "Burlington Downtown | What's Here". burlingtondowntown.ca. Retrieved 9 August 2016. ^ "McMaster Coming to Burlington". City Talk. Spring 2009. p. 1. ^ "CSU Ontario 5yr Celebration" (PDF). Archived from the original (PDF) on 24 February 2011. Retrieved 6 July 2010. ^ "Canadian passenger train crash kills three in Ontario". BBC News. 27 February 2012. ^ "Form EL08 - Certificate of Election Results" (PDF). City of Burlington. Retrieved 10 January 2019. ^ "The Brant Street Pier". The City of Burlington. Retrieved 2 October 2013. ^ "Art Gallery of Burlington Home Page". Retrieved 14 December 2015. ^ "Public Art Inventory". burlingtonpublicart.com. 25 May 2010. Retrieved 27 March 2018. ^ McNeil, Mark (29 July 2014). "Burlington memorial pays tribute to Korean War navy vets". Retrieved 27 March 2018 – via www.thespec.com. ^ "Appleby Ice Centre (City of Burlington)". Retrieved 14 December 2015. ^ "Burlington Performing Arts Centre Home Page". Retrieved 14 December 2015. ^ "Burlington Area Scouting Website". bu.scouter.ca. 27 February 2011. Retrieved 10 March 2011. ^ "Tiger-Cats eye Burlington for stadium". InsideHalton Article. 27 December 2010. Retrieved 10 March 2011. ^ "City of Burlington Website, Burlington International Games". Archived from the original on 1 September 2006. ^ "Twin Cities - Apeldoorn and Itabashi". www.burlington.ca. Retrieved 27 March 2018. Wikimedia Commons has media related to Burlington, Ontario. Wikivoyage has a travel guide for Burlington, Ontario.